Out of 261 comments, the winner of the Accuquilt GO! Baby and 3 dies is . . . #100: Stephanie of Spontaneous Threads! I'm so excited for you Stephanie, though I wish we had a few dozen of these to give away. Thanks everyone for playing along. :) The most common cutting tools are most definitely rotary cutters, but plain old scissors come in a close second! If you didn't win this time, I often link up other GO! Baby giveaways I run across at Craft Buds, so check out the giveaways roundup to see what's up for grabs this week. Lots of goodies! Do you have a quilt pet? 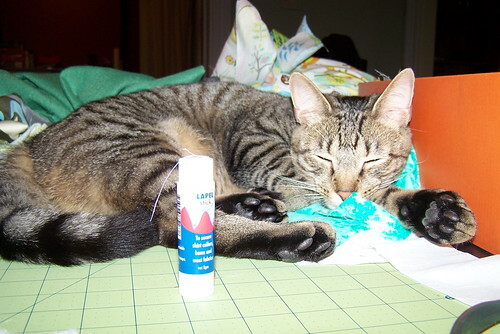 A pet that sits on your quilts, won't stay out of your stash and looks adorable doing so? Well, you might just cash in at the Pets on Quilts show! Link up your blog post through this Friday for a chance to win one of many prizes including $150 to Fat Quarter Shop. Two of my bloggy friends, Sarah and Jennifer are hosting an Across the Sea Quilt Along. It's a super cute design, with a pieced back, and you can follow along to make a lap or baby size quilt. And there are prizes . . . Check it out! Sara at Sew Sweetness is running a series on her blog called Sewing Back-To School. It includes a month of posts on everything about sewing basics, tools, and tips! In fact, I'm guest posting there this Friday with some advice on fabric cutting tools, so be sure to follow her blog for updates every day. Also, you still have until the 28th to get together an entry for the Blogger's Dinner Party! Link up something you've sewn for the kitchen or dining room. It can be anything you've sewn in the past year, or something new--just write a new blog post for it! Congrats Stephanie! I am so beyond excited for you! Lindsay, thanks for all the great links and information! Yeah for Stephanie! Thanks for the great giveaway!